motivation – Biscotti and a Ph.D.
Let’s face it – Mondays are difficult. This Monday is particularly a struggle because my half marathon training officially begins this week (yikes). Back in January my sister and I thought it would be a great idea to sign up for our second half marathon. With doughnut in hand, I registered for the Rock ‘n Roll Savannah race that takes place in November. Last year we survived the Rock ‘n Roll Nashville half marathon (I’ve never seen so many hills – and I’m from the mountains…), and I guess the pain of that race momentarily escaped us. I’m certainly not the fastest, and I don’t think anyone will ever look at me and say, “oh, she’s definitely a runner,” but I try, and that’s what counts, right? However, ever since that last half, I’ve really struggled with running. I’m not sure if it’s mental, or if I’m just getting old (what happened to motivational Monday??). Either way, I’m determined to use this training to make me tougher, as an escape from the craziness of work/life, for my own health, and hopefully beat my time from Nashville! I’ll be using the Sub 2:30 Half Marathon training plan on runkeeper.com if you’re interested or would like to find a plan to suit your running skills. Look me up (Autumn L.) and we can be running pals (i.e., keep me accountable)! If you have any helpful tips for staying motivated during the training process, I’d love to hear them. Have a great Monday and happy running! 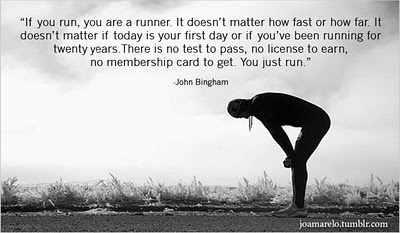 Thanks to GoneForaRun.com for this motivational quote!